Been loving this brand new cut from Midland since he dropped it on his Boiler Room set back in June over in Milan. He’s releasing the infectious number on ReGraded, a new sub label of his own label Graded, intended to focus on sample-based, disco-tinged house. Sounds good to us. You can also get a taste for the B-side ‘Stop, Don’t Let The Beat’ on B-Traits’ Radio 1 show here. And for yet more Midland, it’s worth checking out his August residency on Rinse FM every Friday night. You can hear ANOTHER of his new tunes ‘Blush’, coming in just after the thirteen minute mark. Along with a guest mix from Zurich-based DJ Eli Verveine coming in later on, it’s a top listen. For yet MORE Deetron, have a peak at his April residency shows on Rinse FM. They’re class. We’re a little biased given that xxxy is headlining our next Human Drizzle Presents, but even the most neutral, cold-hearted, mid-week listener can’t help but be moved by this rolling club house track, flecked with his usual garage influences. Premiered over at Deep House London, ’18 Hours’ comes out on an eponymous three-track EP on Rinse and we just can’t wait to hear more. 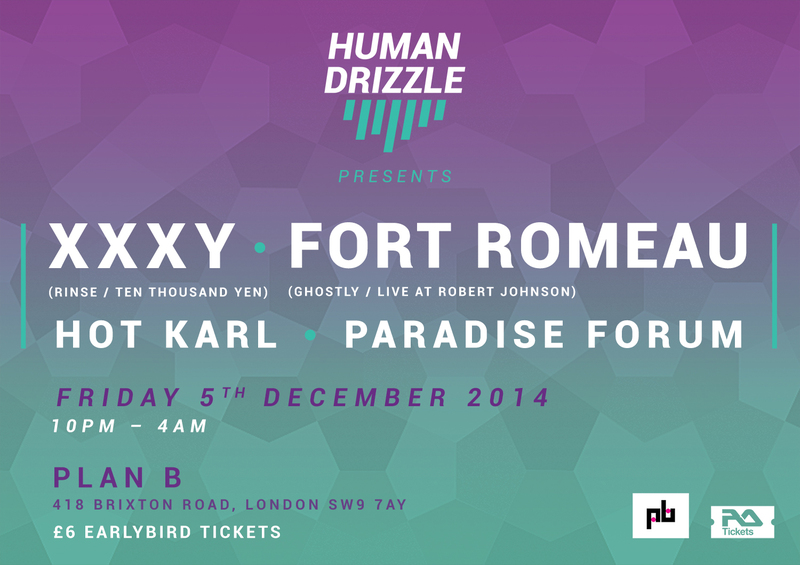 It’s described as “a gorgeous… whirlpool of a club track”, come get sucked in on 5th December. After their tempting offer for our Parisian readers last week, Boiler Room have now put up some of the mixes from the night, and we think Yuksek’s is the pick of the bunch. Continuing our affair with the Rinse podcasts, we also bring you the latest from Brackles, who doesn’t disappoint with a garage-flavoured romp through the more urban end of dance music, if you’ll forgive the 1xtra vocab. Both of ‘em are worth the extended listen. Lovely to see Du Tonc’s feel-good hit ‘Surging Memories’ resurface as the duo comprised of Mighty Mouse and Matt Van Schie are releasing a bunch of remixes for the track. First up is a breezy and piano-laden rework from the Belgian producer Attar! Second in line is Kiwi. The recent signing to Duke Dumont’s Blasé Boys Club is everywhere at the moment*, and as with most of his tunes, there’s a gradual progression to this effort that’s sure to go down well. You will be able to buy these come 23rd June, along with other efforts from Le Visiteur and Adapt Or Die. For the Londoners amongst you, you may want to put Friday 22nd August in the diary too. Du Tonc are playing a DJ set alongside Moonboots and Lancelot at The Nest, definitely one to consider. We’ve been going a little Four Tet mad on these pages recently but, if you’ve given his new LP a spin, you’ll forgive us we’re sure. It’s as atmospheric as you’d think, with a strong seam of UKG running through it. See what follows it (for the remaining seven hours and 56 minutes…) here. So, finally, it’s happening. Breach‘s ‘Everything You Never Had (We Had It All)’ featuring Andreya Triana on vocals looks like it is finally going to get a release. This has got us extremely excited. Four months ago, it was played by Annie Mac on her show, and two days later T. Williams featured it on his Sunday night Rinse FM broadcast, to a massive response. But then…nothing. Rips of those shows disappeared off the web, and there was no sign of any release date, although young Ben and Eats Everything continued to play the song out. Maybe Mr. Westbeach was overwhelmed by the success of his massive summer hit ‘Jack’ and fantastic remix of ‘Everything’ by Maya Jane Coles and decided to shelve the release for a bit…? Who knows? Who cares? It’s here now and, despite it being in clip form, it looks certain that this will be Breach’s next single. The tune itself can only be described as a dance floor banger, with a soaring finale. It mixes a thumping house beat over Andreya’s soulful vocals, with a crescendo that sees him return to the type of intensity that made ‘You Won’t Find Love Again’ such a brilliant tune last summer. We really can’t get enough of it. As for Ben himself, he continues to go from strength to strength, with an increasingly impressive range of releases. 2013 has been huge for him. Catch Breach and T. Williams amongst a strong line up at XOYO next weekend for Bugged Out! Here’s something to give your Fridays a little boost. Having recently gained over one thousand followers on Soundcloud, London-based producer Copy Paste Soul crafted this high-energy DnB track to say thank you. Make sure you’ve had a couple of coffees before you plug this one in. We’ve been keeping a close eye on this fella ever since he dropped his ‘Look At Me’ EP on Exploited Records earlier this year, a real gem wethinks. That and some exciting unreleased material feature on the brilliant mix he did the other day for T. Williams on Rinse FM. Both are below and are the perfect soundtrack to your Fridays. If you’re still interested, this week saw the elusive figure do a remix for Photek too that’s worth an ear. Busy chap.